Right now I am working on the Connect Power site build to make an underground railroad to help people out of the mental health system. It will have both unpaid and paid peer support, since people need jobs but also friends. “Peers” are defined on my site the same as done by Loren Mosher in the Soteria project – anyone who isn’t a mental health professional. It’s just not sustainable to have people work out their concerns with one on one conversations where one person in the room has seven years of student loans to pay off. In the meantime, I am short on blogging time and I wanted to post some ideas that other people can take to develop for this site. I’d love to see someone flesh them out and move forward so these ideas don’t die in my “blog idea” notebook. Some of these ideas are personal experiences and can be done over and over but some only need done once. If you are committed to one of the more science based or one time blog ideas, it might be useful to say which you want in the comments so people don’t end up covering topics twice. When I’m not working 50 hours a week to build a business and revolution, I’m bicycling, gardening, or enjoying my new family. 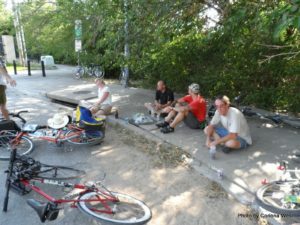 My bike friends after the “Heat Stroke” alley kat race we did since it was forecasted to be 107 degrees that day..
SAMHSA ought to fund recovery, not disease marketing. So why do they keep talking about how mental health is the coming plague with a huge disease burden about to doom us all? Why did their Brass Tacs peer scaleup grant to expand peer support not have any selection criteria at all for whether the business was scaleable? Why did their Million Hearts Social Messaging grant have two out of the four contract deliverables about getting peers on heart meds instead of getting them off the psych meds that cause an 18 fold increase in heart attacks? Peer support is not medical help, it is life situational help because “mental illness” is not a disease, it’s emotional distress. So why do some doctors keep insisting that peer support IS medical help? What is medical and what is life situational? Lots of government agencies say they want “consumer” input but don’t know how to find us. How can we use online forums and social messaging to solve the problem that mental health agencies need our input but aren’t willing to pay us for our time? Everyone else in the room in those meetings is on the clock for some agency. What about using more forums like this: http://feedback.samhsa.gov/forums/77283-closed-samhsa-s-strategic-initiatives You can read through some of the topics archives although this input forum is closed. BMW Drive for Team USA event in Kansas City. The test drive crew didn’t believe when I offered to pick them up. Is mental ilness a chemical imbalance? Of course we know it’s not but it would be extremely powerful to have a list of heavily cited mainstream right wing academic types who have said this. Just a list, no commentary at all, just 20 or statements made by the powers that be admitting they know there is no chemical imbalance. Then we could refer people to this list whenever needed. Why people need to be active in their community, why they aren’t, how they can find cheap or free events to do – how to make friends. What to do to overcome “not being able to pass” for a chronically normal person if that’s what’s keeping people isolated. 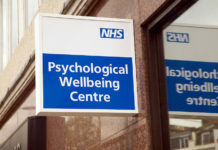 How did you enter the mental health system? What could have been done instead? How would you have liked it to be different? : http://corinnawest.com/maybe-i-never-needed-a-psychiatric-label-at-all/ If we all do a bunch of these stories, it would have good impact. Psych meds are like painkillers – sometimes we need emotional distance but we should know full risks and how they dampen our responses. Maybe mental health “treatment” should be just like the pain management clinic where they teach you how to live well instead around chronic pain instead of just numbing it out. Have psych meds ever stopped you from processing grief in some way? Or stopped your development so you are socially or mentally too young? We need a blog on service dogs with more information about how to train one or find one and how to win access arguments when they come up. How does social media help make your life better? Wow! What an inspiring blog post! I’m definitely going to check out the http://www.surveymonkey.com/s/KQRCJ5X re: underground railroads. I have had some haphazardly earnest experiences trying to help a few friends and familiars get out of psychiatric abuse situations. 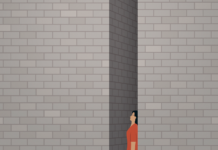 Supporting people trying to break free or start over is really powerful, but the crossroads can be a tricky place. Amazing to see people strategizing the underground railroad. That is a visionary and much needed network. Best of luck in pushing the project forward in the coming days. In the meantime, I’d love to spend some time structuring ideas about these topics you presented, not necessarily all of them, and not necessarily even to the point of a coherent completed piece of writing, though that would be nice. Still, I’d not want my interest to discourage anyone else from writing on/thinking about these topics. The Peer issue is a tricky one for me right now, as I am very conscientious and deeply service and integrity oriented. Yet, the organization I work for as a Peer does have elements of medical model practice…none of which I am involved in, of which I am vocally critical, and which in practice I directly challenge by speaking with people about how to effectively self-advocate around issues of reducing/coming-off medication or accessing resources and ideas that erode the illness worldview and other harmful and unhelpful notions of who we are and what our experience entails. So, while I feel somewhat stealthy and valiant on the one hand, to be facilitating liberated and proactive recovery in a community mental health center…on the other hand, I feel a lot of cognitive dissonance for participating in a system that I really wish didn’t exist at all. I wish the whole state-funded mental health system would just turn itself inside out and give money to local groups creating programs that reinforce and build on the strength of communities and families in ways that nurture sustainable networks of vital support, activity and meaning. Maybe they could pull some money out of the hospital coffers and fund arts and culture and wellness opportunities for meaningful participation in community? I make a lot of wishes about the way I wish the world were. It is, I have begun to realize, a wellness tool for me. Your questions about SAMHSA are good. People know what works and they know it costs less to support people being well than it does to support them being ill. Obviously, the systems have interests other than recovery. I’m really fairly confused about my role as something of a radical humanist who facilitates self-directed recovery under the guise of state-funded recovery education and, right now, that muddies my clear consideration of anything Peer/System-related, though the question re: life situational/medical is a good one. Though it is obvious to me that anything of the mind and heart is a non-medical issue, it seems that psychiatry is, again, tragically confused about human beings. It’d be a fun little writing exercise to explore these topics. If I come up with anything worth refining and expanding – I’ll refine and expand it and share it with you via MiA message. Thank you again for the inspiration. Sorry about the double post…not sure how that happened or that it was even possible to post the same thing twice on MiA. If someone wouldn’t mind deleting some of all this…? Thanks! Why can’t we delete our own comments on MiA? The Peer issue is a tricky one for me right now, as I am very conscientious and deeply service and integrity oriented. Yet, the organization I work for as a Peer does have elements of medical model practice…none of which I am involved in, of which I am vocally critical, and which in practice I directly challenge by speaking with people about how to effectively self-advocate around issues of reducing/coming-off medication or accessing resources and ideas that erode the illness worldview and other harmful and unhelpful notions of who we are and what our experience entails. So, while I feel somewhat stealthy and valiant on the one hand, to be facilitating liberated and proactive recovery in a community mental health center…on the other hand, I feel a lot of cognitive dissonance for participating in a system that I really wish didn’t exist at all. I wish the whole state-funded mental health system would just turn itself inside out and give money to local groups creating programs that reinforce and build on the strength of communities and families in ways that nurture sustainable networks of vital support, activity and meaning. Maybe they could pull some money out of the hospital coffers and fund arts and culture and wellness opportunities for meaningful participation in community? I make a lot of wishes about the way I wish the world were. Wishful thinking is, I have begun to realize, a wellness tool for me. The questions about SAMHSA are good ones. People know what works and they know it costs less to support people being well than it does to support them being ill. Obviously, the systems have interests other than recovery. Corinna, you go, girl! I admire you. I admire your work. Keep going. I’m not sure which inspires me more: Your amazing life story, your creativity, or your entrepreneurial determination to bring peer support, healing and empowerment to scale. You go girl! As Emily said, “you go girl!” May the force be with you! I’m learning! Thanks again for the very good, and needed, lesson. I don’t know what this is in reference to, but as someone who is still learning, too, I appreciated it. Peer support has always sounded like a great idea to me. I have a hard time keeping up in cyberspace, but I’d surely be up for participation. I’ll check out the link for the survey. I am reading every book I can get my hands on with regards to the history of psychiatry, and I am constantly writing on these topics. It would be great to get involved (and if there were paid positions, even better) in more effective ways for combating coercive psychiatry.